You know I recommend the Kindle for public speaking--for references, for speech texts, and for holding your notes. Why not have your speaking coach there, too? 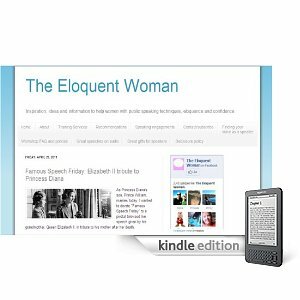 Now you can subscribe to The Eloquent Woman blog on your Amazon Kindle. Monthly subscriptions cost $1.99 and the first one comes with a free 14-day trial. You'll get automatic updates whenever the blog posts are published. I'm excited about this new option, which joins the many other ways you can access the blog by RSS, email and more. Please share it with your Kindle-toting friends, teachers, librarians, students and colleagues.